Register for training events and product demonstrations online! Please review our event and training schedule to find one you’re interested in, and click the link to join the event. Trainings are interactive, including a question and answer period, everyone is encouraged to bring their questions. Did you miss a live training? 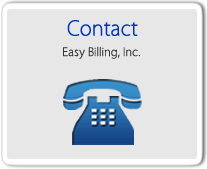 Easy Billing Pro users can now access our training archives here. Browse through our videos labeled with dates and training subjects. Call or email for access password.